Welcome to Digital Digest! We still have a little more than a month to go until the fall season starts for the broadcast networks, but we're here for more news about all things digital relating to your favorite TV series all summer long! This week, we have all of our regular features, including reviews of Father Dowling Mysteries - The Second Season and 87th Precinct - The Complete Series. Let's get going! 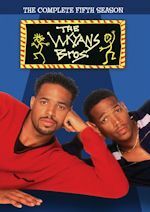 This week, Universal announced a few more DVD releases, essentially finishing up their slate of releases of returning series on DVD from the 2011-2012 season. Announcements this week came for 30 Rock - Season Six and Whitney - Season One. Tentatively, 30 Rock is scheduled for September 11, and Whitney is scheduled for October 9. Several October releases from Shout! appeared on amazon.com this week. First up, on October 9, is Webster - 20 Timeless Episodes, containing 20 fan favorite episodes of the '80s series starring Emmanuel Lewis. October 23 brings more of Mr. Roarke and Tattoo with Fantasy Island - The Complete Third Season. Finally, on October 30, Shout! brings fans of All in the Family the entire series with All in the Family - The Complete Series. The set will contain every episode of the series, but we don't know what (if any) special features it will include just yet. Mill Creek is moving ahead with more releases from the Carsey-Werner library on September 4, but as usual, all of these are just re-releases of DVDs previously released by Anchor Bay and Fox. Roseanne continues with Roseanne - The Complete Fifth Season and Roseanne - The Complete Sixth Season, while That '70s Show continues with That '70s Show - The Complete Fifth Season and That '70s Show - The Complete Sixth Season. Fans of Grounded for Life won't get any new season releases on September 4, but instead will get much more with Grounded for Life - The Complete Series. There is no word on any new re-releases for 3rd Rock from the Sun yet, but we'll let you know if we do hear something. Finally we mentioned in early June, the '70s detective drama Harry O would be coming soon from Warner Archive. Now, it is no longer just "coming soon," it is already released! 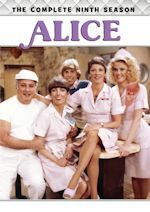 This past Wednesday (all Tuesday releases from Warner Archive were pushed back a day this week), Harry O - The Complete First Season was made available to order from Warner Archive. We had hoped to have a review of this today, but we did not receive our copy in time... so look for our review of it next week in Digital Digest. Tuesday (July 17) doesn't have a whole lot in store, but it does bring two new sitcom releases to DVD from Shout! 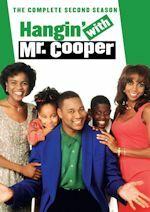 Factory, with Diff'rent Strokes - The Complete Third Season (DVD review) and Designing Women - The Final Season (DVD review). Crime doesn't have a prayer. No one has more faith than Father Frank Dowling (Tom Bosley) and Sister Stephanie "Steve" Oskowski (Tray Nelson) in Season 2 of Father Dowling Mysteries. Together, they guide a congregation in the ways of good, even as they track down Chicago's agents of evil. At home, trusty housekeeper Marie (Mary Wickes) keeps the good priest sane and fed, while still managing to get entangled in a little mystery herself. From an impostor priest to a spy couple to an evil twin, there's no case that can't be solved with a little help from above. Father Dowling Mysteries moved to ABC for the second and third seasons. It aired on Thursdays at 8pm for the second season. The season premiere was broadcast on January 4, 1990. Here are the episodes included in this release. "The Visiting Priest Mystery" (1/04/90) (48:55) - Father Dowling and Sister Steve are suspicious of a visiting priest, who turns out to be a hit man out to kill an ex-mobster turned informant. "The Exotic Dance Mystery" (1/11/90) (48:36) - To solve the murder of an exotic dancer, Father Dowling sends Steve undercover as a dealer in a backroom, high-stakes poker game. "The Santcuary Mystery" (1/18/90) (48:30) - Sister Steve's troubled younger brother witnesses a murder. But when the killer turns out to be a police captain, little brother ends up being framed for the crime. "The Stone Killer Mystery" (1/25/90) (48:26) - An ex-con who Father Dowling helped put away is out on parole and gunning for vengeance...hoping to give Frank a death sentence. "The Woman Scorned Mystery" (2/01/90) (48:20) - Scandal erupts when Father Dowling is mistaken for his evil twin brother, who is seducing and swindling young women. But when the scam takes a murderous turn, Frank must clear his name. "The Ghost of a Chance Mystery" (2/08/90) (47:36) - When a young woman believes her house is haunted, Father Dowling and Steve spend the night in her home to get to the bottom of the supernatural happenings. "The Blind Man's Bluff Mystery" (2/15/90) (46:20) - Sister Steve falls for the scam of a "blind man" who in reality is a con man out to blackmail a parishioner. "The Falling Angel Mystery" (2/22/90) (47:50) - Frank receives a visit from an "angel," who warns him that one of his parishioners is in grave danger. Now, Father Dowling steps in to try and save a life. "The Perfect Couple Mystery" (3/08/90) (47:13) - When one of their parishioners suspects her husband of infidelity, Father Dowling and Sister Steve are embroiled in a case that escalates into a matter of national security. "The Confidence Mystery" (3/15/90) (47:22) - Father Prestwick is in charge of returning a valuable chalice to Romania, but a con artist is looking to steal the sacred item...unless Father Dowling and Sister Steve can thwart the con man's plan. "The Solid Gold Headache Mystery" (3/29/90) (47:50) - A wealthy parishioner names Sister Steve as the administrator of his $6 million trust. But the late man's grown and greedy children go to dangerous lengths to keep the money in the family. "The Legacy Mystery" (4/12/90) (47:52) - Someone has been stealing art objects that belong to the wealthy Cabot family estate. But Father Dowling suspects that the Cabots' sole surviving son may be to blame. "The Passionate Painter Mystery" (4/26/90) (47:39) - A troubled artist's alcohol addiction may jeopardize his promising future...but not as much as the threat from whoever is trying to kill him. All 13 episodes run between 46-48 minutes. There's a disclaimer on the back cover that reads: "Some episodes may be edited from their original network versions. Music has been changed for this home entertainment version." This is a standard disclaimer on most CBS DVD releases, so it doesn't necessarily mean any episodes are actually edited. I don't know how much music the show originally used, but hopefully any music substitutions are very minor. The set has a total running time of approximately 10 hours, 23 minutes. The packaging for this 3-disc set is a clear plastic Viva case. 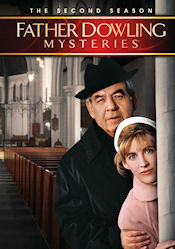 On the cover, we have a photo of Tom Bosley and Tracy Nelson, along with the show title and interior church background. A cast photo of James Stephens, Tracy Nelson, Tom Bosley and Mary Wickes is used on the back cover. There are four additional episode snapshots below it. A short synopsis, a listing of the special features and the DVD specs are provided. Tom Bosley is, once again, featured on the spine of the case. Inside, the episode titles, original airdates and short summaries are listed by disc. A tinted photo of the church interior is used as the background. The discs just have gray artwork, with the show logo and episode titles on them. Discs 1 and 2 contain 4 episodes. Disc 3 contains 5 episodes. Moving on to the menus, they are simple and easy to navigate. Each main menu features a different photo: Tom osley on Disc 1, Tracy Nelson on Disc 2, and Tracy Nelson and Tom Bosley on Disc 3. A church altar and pews are in the background. The show logo is in a red bar at the top of the screen. Below that is a gold bar with the season and disc number. The episode titles are listed vertically in yellow text. When you select an episode, it takes you to another sub-menu where there is a different episode snapshot of Bosley and Nelson for each episode. The episode title is listed in a red banner at the top. There are options to play the episode or the episodic promo. There is no Play All option. The subtitles menu features a photo of the four main cast members. Chapters are placed at the appropriate places. When you first insert Disc 1, there is an option to play previews or go to the main menu. There are about 3 minutes worth of previews for Blue Bloods - The First Season, Hawaii Five-0 - The Final Season and Perry Mason - The 50th Anniversary Edition. The video and audio quality seems slightly improved over the first season. I don't know how much remastering these episodes received, but they certainly could have used some more cleaning. These episodes were shot over 20 years ago, so they do show some age. They are presented in their original full frame ratio and in their original broadcast order. Father Dowling Mysteries was shot on film. There were many outdoor scenes and different locations used. After the first season was shot in Denver, CO, the show's production was moved to Los Angeles for the final two seasons. The first season episodes looked a bit dark and gritty, but the second season episodes appear brighter. Maybe it was the switch in shooting locations. There is some dirt, debris and other digital artifacts in the episodes, but I didn't see any major problems. The audio is a Dolby Digital English Stereo track. I didn't hear any problems with the audio. This show had a very nice melodic theme and score in the episodes. English subtitles for the deaf and hard of hearing are available on all of the episodes. Original episodic promos are included as a special feature. These are 35-40 second previews that tell you what's happening "next on Father Dowling". The video quality of these promos isn't as good as the episodes, but they are fun to see. They give you a good idea of what each episode is about. Every episode includes one this time. It would have been nice to have some other additional material like cast and crew interviews or audio commentaries. Everyone's favorite mystery-solving priest is back on DVD. I wasn't sure how well the first season would sell, but it apparently did well enough for the second season to be released. It was only about a five month wait between seasons, which isn't too bad these days. Shows like Murder She, Wrote, Diagnosis: Murder and Matlock have many fans and are popular on DVD. Father Dowling Mysteries falls into the same genre. Everyone enjoys a good mystery. Season two was notable for a couple of reasons. Production was moved from Denver to Los Angeles. They also switched networks from NBC to ABC. Some notable guest stars this season included Anthony LaPaglia, Xander Berkeley, Stephen Dorff, Yaphet Kotto, Paul Gleason, Steven Culp, Brenda Strong, Stacy Edwards, Ed Lauter, Stanley Kamel, Eric Christmas, Valerie Mahaffey, Robin Thomas and Roscoe Lee Browne. If the release pattern holds, we should see the third and final season sometime later this year or early next year. The third season had a full order of 22 episodes, so let's hope they release them all together in one release and don't split them into two volumes. In 1956, Ed McBain (born Salvatore Albert Lombino, and already having legally changed his name to Evan Hunter) began writing a series of crime novels which fans just couldn't put down. One of his most popular series of novels, though, came from his 87th Precinct series, which began with a book called Cop Hater. The book (and series) was inspired in part by a TV series which McBain had seen on television and admired starring Jack Webb: the original version of Dragnet. 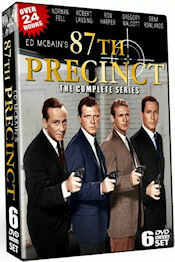 Little would he have expected, then, that just five years later in 1961, McBain's own work would be brought to life on the small screen on NBC with their TV series 87th Precinct, a series focusing on neighborhood crime in Manhattan. The TV series featured a group of detectives and even their families, starring Robert Lansing as Steve Carella (not to be confused with Steve Carell, of course) and Gena Rowlands as Teddy, his wife. Ron Harper filled the role of the rookie detective Bert Kling, Gregory Walcott was the long-time veteran Gregory Walcott, and then there was the wryly philosophical character Meyer Meyer (that isn't a typo, it's a same first and last name), played by a man who was very much just at the beginning of what would be a much larger television career: the one and only Norman Fell. The TV series only lasted one year on NBC, mostly due to facing time slot competition from the second season of a more lighthearted sitcom about a police officer on CBS: The Andy Griffith Show. The set begins with "The Floater," where Carella is on the hunt for a sadistic man (played by Robert Culp) preying on lonely women. In "Lady in Waiting," a woman decides to wait for her husband's release from prison by bringing a gun into the precinct and threatening to use it. The detectives follow up on an anonymous note about a death threat in "Lady Killer." A disgruntled ex-cop keeps committing the perfect robberies in "The Modus Man." In "Line of Duty," Kling is forced to shoot (and kill) a suspect, and can't help but to feel badly about it. A pregnant wife keeps a man from cooperating with the police in "Occupation, Citizen." Beverly Garland and Jack Albertson guest star in "Killer's Payoff," where a blackmailer is murdered. Meyer arrests an old friend for a robbery in "The Guilt," but things get worse for the man when he escapes police custody. In "The Empty Hours," a woman (Pat Crowley) decides to pretend to be a deceased friend for financial gain, unaware that the friend is wanted by a killer. A young man is suspected of murdering a coed in "My Friend, My Enemy." Leonard Nimoy guest stars in "The Very Hard Sell," where a used car salesman is found dead, slumped over a steering wheel. In "'Til Death," an about-to-be-married couple is getting some anonymous threats. A crook (played by Robert Vaughn) sets off false alarms everywhere to commit a more serious crime, hopefully unnoticed, in "The Heckler." In "Run, Rabbit, Run," a condemned gangster has much more planned beyond his death. The detectives investigate death threats toward a boxer in "Main Event." In "Man in a Jam," a man arrested for murder has some creative ways of trying to get out of trouble. A hand found in a dumpster leads to a murder investigation in "Give the Boys a Great Big Hand." Dawn Wells guest stars in "Out of Order," where telephone booths (what are those, again?) are the target of explosions. In "The Pigeon," a man (played by Peter Falk) is a smalltime criminal but wants to pretend to be bigger... making him the perfect fall guy for some serious criminals. Frank Sutton also guest stars. A 10-year-old may be helpful in solving a murder in "A Bullet for Katie." A kidnapping doesn't go as planned in "King's Ransom." Both John Astin and Nancy Reagan (in one of her very last appearances as "just another actress" in a TV series) guest star. Meyer needs some rest while feeling ill in "Feel of the Trigger," but he just can't stop working hard. The detectives have a lot of clues to go through in the murder of a beautiful woman in "Killer's Choice." In "Square Cop," one officer is about to retire and the other one is a rookie being trained by the veteran... and one of them is shot by the others son during a burglary. 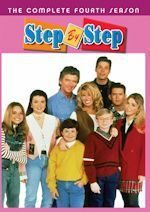 Carella needs extra cash and takes a job as a night security guard at a bank in "Step Forward." A baseball star risks everything by hiding his fugitive brother from the cops in "Idol in the Dust." Havilland's new friend wants to kill a South American dignitary in "Ramon." In "New Man in the Precinct," there is a new guy at the 87th, and isn't quite used to being at such a rough and tumble precinct. Another detective ends up at the precinct after being demoted in "The Last Stop," and he isn't quite well-received after he drives everybody crazy. The series ends with "Girl in the Case," where Havilland becomes attracted to a stenographer who is being threatened. The set comes packaged in a six disc case that is twice as thick as a standard DVD case. The cover art has a color photo of the four male stars of the series with their guns drawn, and on the back, we get a brief description of the series, along with a few photos and a breakdown of episode titles by disc. Inside, you'll find the six discs containing the episodes, all of which have a different photo of one of the stars and the logo from the cover (which is not the logo used in the series, but that isn't a huge deal). Each disc contains five episodes. Oddly enough, you'll find inside the case a seventh "unadvertised" disc inside of a white paper envelope. This contains the unannounced special feature, which we'll discuss a bit later. The menus on the set are very basic, but functional. The main menu shows a black and white photo of the cast (same one seen on the cover), and lists all of the episodes on the disc. The theme song plays in the background of the menus. Once you select an episode, it plays immediately. Chapters are placed throughout each episode at all of the commercial break points. This series has largely remained in obscurity since it originally aired 50 years ago. In fact, I'm not sure that it has ever aired anywhere. So it should be no surprise that the video and audio quality is far from perfect. Nothing is too sharp in any of the episodes, and there is grain, debris, and scratches all over the place. But there is also some variance between the episodes. I'm sure that Universal (the rights holder) for the series hasn't really bothered restoring this series at all, so everything was likely left up to TMG to clean them up. With that being said, though, the episodes do not look terrible. They don't look like low-budget public domain episodes (and they shouldn't since this prints are "direct from the Universal vault" as the packaging indicates). The audio is a little low and has some crackle in it, but it won't be enough to bother most people. The episodes are neither closed-captioned nor subtitled. This set wasn't advertised as having any special features, and nowhere on the packaging does it indicate that there are any... but much to my surprise, upon opening up the set, a bonus disc inside of a paper sleeve popped out! Considering that this wasn't announced or even advertised on the set, and only included inside of the white paper sleeve, I have a feeling that this may have been a last minute addition, but I'm sure those buying the set will appreciate it. The main feature here is an interview with Ron Harper (34:38), the actor who played Bert Kling on the series. It is a very nice in-depth interview where he talks a bit about his life in general, and also about his experiences on the series and working with the costars. "Ron Harper's 87th Precinct Scrapbook" (4:38), where Harper goes through a personal scrapbook which he created about the series. He shows some of the original articles about the series (including one from his hometown newspaper), photos of Nancy Reagan on the set, a crossword puzzle where his own name was a clue, and some photos of him with Marlo Thomas. These are really nice features to see, and it is clear that this was an important part in his life. I am very glad that TMG managed to include this. All in all, this isn't a perfect set, but considering the rarity of the series, it is surprising that we even got to see it on DVD at all. Really, the only issue is the video and audio quality, but I doubt that anybody could really restore that to "perfection" profitably. The series has been neglected over the past five decades (mostly by just sitting in the vaults), so honestly, I'm surprised it doesn't look worse. Personally, I think those issues are very easy to look past once you see what you have here: an entertaining drama about a police precinct from the early days of television. It is a lot like Dragnet (the original version, anyway, not necessarily the late '60s version), except of course the stories here are not based upon true stories, and are excellent works of fiction. The series really reminds me a lot of something like Perry Mason, only here, things are focused on the precinct angle of the action rather than the attorney in the court room. It is too bad that this series only made it through one season, as there are infinitely many ways to write stories for a series like this. But of course, the competition made it hard to go too far. It is worth noting that there is a bit of irony in the novel series written by Ed McBain, which by the way were still written all the way up through his death in 2005. By his own admission, he received his inspiration from Dragnet. Over 20 years after the first 87th Precinct novel was published, elements of this novel series inspired another TV show on NBC... Hill Street Blues. And reportedly, this didn't exactly thrill McBain, as he felt that his ideas had been stolen (although he didn't make a big deal over it, because by his own acknowledgment, he, too, had used ideas of others). We probably don't have too many people reading this who actually remember this series from the original airing, but that isn't really a prerequisite to enjoying the stories. I think that fans of those novels are certain to love this series, and also fans of very early police dramas will be pleased. Game Show Temple (www.thegameshowtemple.com) - We're continuing up our game show theme for Click of the Week this week with a much broader game show website dedicated to multiple game shows rather than just one. It isn't the sleekest website out there, but it is a very nice website with information for several game shows. First, they have the rule sheets for game shows going back to the '70s, including some game shows which many of us have long forgotten (such as the Peter Tomarken hosted Hit Man). In these rule sheets, you can go through the series and read how each game was played, along with screenshots from many of these series to demonstrate what is being discussed. The video database gives a ton of links to YouTube for an astonishing 76 different game shows. Theoretically, you could find all of these one-by-one on YouTube, but this site places it all in a nicely organized fashion. There are even interviews with game show contestants (you'll see that many of them work their way around the circuit), although you may not know who these people are unless you are a game show junkie. But still, it is interesting to read about game show experiences from the contestant's end. Mostly, what we have here is a fun website, dedicated primarily to game shows of the '70s and '80s (one of my favorite eras), and I think that game show fans will appreciate this, our Click of the Week.